At first he laughed at the sign because who needs to be warned, “NO SMIWWING”? I think we’re all born with the intrinsic knowledge that smiwwing is not acceptable. But the more he thought about the wanring, the more he felt compelled by the rebellious, overpowering urge to smiw. Optimist Prime took this picture in front of a restaurant and brought it back to me in the hopes I could explain the operational hours. We’ve been dying to try this restaurant, but we’re just not sure if it’s ever open. If we had to pick a day to visit, it would probably be on Fryday, although I’m trying not to eat fried foods. Congratulations to Amy of fixitordeal.wordpress.com for winning the caption contest. Why not spend your Sunday submitting a caption in the new caption contest? That hours schedule is hilarious! Where is it?? The picture is defintely funnier when you can see it. It should be working now. My kids would be all “But, Wowwy, me mant to go Smiwwing”. These crack me up. The more I say smiwwing, the more I welcome it as an alternative to swimming. Is there a swoking jacket cowing? It’s Fryday every day at our house! Yuwwy-www www! I love road and warming sings. Great pics! 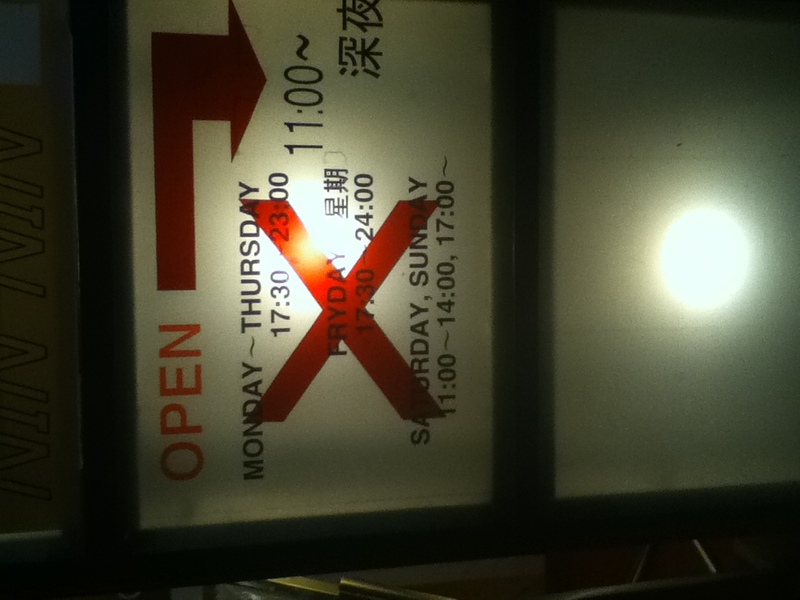 I would be hesitant to go to a restaurant on Fryday…who knows what goes into the deep fryer. I quite enjoy being ‘edumacated’ by your Chinglish lessons. No smiwwing? I can hear the children mhiwpering mith disappointwent. Just spent an embarrassing amount of time trying to figure out how one would even pronounce “smiwwing.” And does no one else see F@#K in the Chinese characters? Just me? 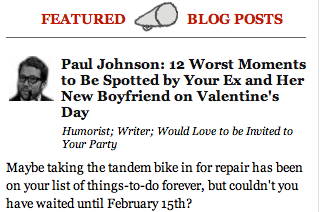 And I can’t believe I finally won that freakin’ caption contest. Thank you to anyone and everyone who voted for me and thanks to my mom who I am sure was responsible for about half the votes. Somewhere in China tonight, a Pub-licking Singer is performing to a packed house who arrived by taking the backwards train. 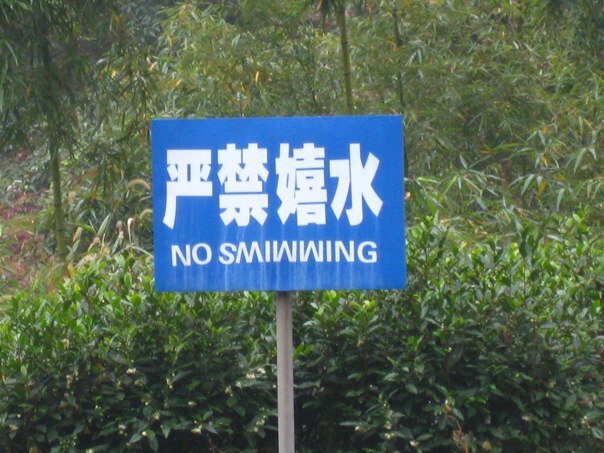 The other great thing about the “no smiwwing” sign is that, the way the picture is framed, it doesn’t appear to be anywhere near a body of water. I don’t mean to imply Japan and China are interchangeable by typing this, but I did experience a few places in Japan where the closing time was, roughly, “whenever we damn well feel like closing.” (Alternatively, “whenever we run out of the beer you keep coming here to buy” is a possibility.) I wonder if that’s what the sign says? Giving a rough number might make the experience a little less head-explodey for those trying to figure out if it’s worth coming at 10 p.m., or whether “when we feel like it” is closer to 7 p.m.
BTW, much as it might clash with others’ principles? I totally smiw at noon every other Thursday. So exclusive it’s only open one hour… some… secret day of the week. Sounds like a warning from the priest in A Princess Bride: Smiwwing is what bwings us togetha today. Mmmm, fryday… my favorite day of the week! It actually means no swimming upside down. “It’s Fryday, Fryday, gotta eat fries on Fryday” — seriously, I’ve been hearing this in a loop in my head all day. Please, please make it stop. They’re open at 11. Just figure out if that is am or pm. When smiwwing is outlawed, only outlaws will smiw. Fryday, darn I missed it. Didn’t a pope declare the day between Thursday and Saturday “Fryday” to remind people they have to eat only fish and chips on that holiest of days?